The Bartholomew County Solid Waste District implemented the Columbus/Bartholomew Yard Waste Program in the Fall of 1990 in an effort to eliminate 20-25% of the residential waste stream. 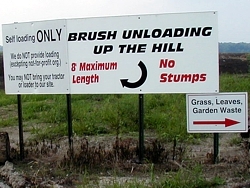 In conjunction with the program, the District banned disposal of yard waste at the landfill, instead diverting the material to the Columbus/Bartholomew Yard Waste Site, where it is composted into a dark, rich in nitrogen humus. Tree branches, trees and bushes are put through a tub-grinder, then re-ground again, and transformed into mulch. Compost and mulch is then used for various City/County landscaping programs and given back to Bartholomew County residents at no cost. Since the Fall of 1990, the program has eliminated over 40,000 tons of material from burial, saving precious space at the Petersville Landfill. That allowed the District the time needed to site and build a new disposal facility, a process that has taken 5 years to accomplish. The Columbus/Bartholomew Yard Waste Site is located at 720 S. Mapleton in Columbus. Hours of operation are Monday - Friday from 7:30am - 4:30pm & Saturday from 8:00am - 3:30pm. When in doubt about where to place a certain material, place it with the brush on the upper level. Hours of Operation, Materials Accepted, and Site Rules apply for residential use only.